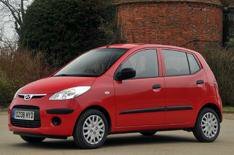 Hyundai i10 1.2 | What Car? Budget motoring doesn't come much better than this. If you don't need the extra space its big brother, the i20, offers, then the i10 is arguably an even better buy. For a start, it's 1000 cheaper and this entry-level model still has items such as air-conditioning and a five-year, unlimited-mileage warranty. The money-saving benefits don't stop there, either. It costs just 35 a year to tax, and should still be worth a decent 39% of its value after three years. Air-conditioning, auxiliary input, CD player (six speakers), central locking, driver/passenger and side airbags, electric front windows, tilt-adjustable steering wheel, split-fold rear seats.